Objective: To study the clinical effect of short implant placement using osteotome sinus floor elevation technique and tent-pole grafting technique with recombinant human bone morphogenetic protein 2 (rhBMP-2) in severely resorbed maxillary area. Methods: Eleven patients with insufficient bone height in the posterior maxillary area were included. According to the native bone height and crown height space (CHS), the patients were divided into two groups: immediate placement of short implants with simultaneous bone augmentation (group A, 5 patients) and delayed dental implant placement (4 to 6 months) after bone augmentation. The rhBMP-2 was added into a deproteinised bovine bone mineral (DBBM) bone grafting material to shorten the treatment procedure and enhance the final effect of bone augmentation in both groups. Tent-pole grafting technique was applied for vertical bone augmentation in group B (6 patients). Results: The success rate of the implants placed was 100% in both groups. In group A, the short implants treatment was successful, with a vertical gain of 1.5 to 6.4 mm in bone height after 4 to 6 months. In group B, the tent-pole grafting procedure in combination with DBBM and rhBMP-2 increased vertical bone height between 3.1 and 8.1 mm, an optimistic and adequate increase for implant placement. This bone increase was maintained following implant placement and final crown placement in the maxillary region (3.5 to 7.3 mm). Conclusion: The tent-pole grafting technique was a viable alternative choice to lateral sinus floor elevation in cases with excessive CHS. The application of rhBMP-2 with a shortened treatment time demonstrated positive outcomes in sinus floor augmentation procedures. Objective: To determine the association of high occlusal force (HOF) with the signs of occlusal trauma and periodontal conditions in periodontitis patients, and elaborate the relevant clinical implications. Methods: Periodontal parameters and signs of occlusal trauma were recorded for 807 teeth in 30 subjects with untreated chronic periodontitis. The T-scan II occlusal analysis system determined the HOF during maximum intercuspation, lateral excursion and protrusive excursion. The correlation of HOF with periodontal parameters and signs of occlusal trauma was analysed. Results: Overall, the teeth with HOF existed mainly in molars and presented with deeper probing depth (PD) and higher frequency of bleeding on probing (BOP) than those without HOF. The fixed-effect analysis showed that HOF was positively correlated with PD and BOP (P < 0.05) in posterior teeth; widened periodontal ligament space on radiographs in upper (r = 0.179, P < 0.01) and lower posterior teeth (r = 0.205; P < 0.05); as well as functional mobility in upper posterior teeth (r = 0.168; P < 0.05). Conclusion: This study suggests that the posterior teeth with HOF in subjects with chronic periodontitis may reflect occlusal trauma-associated periodontal conditions that could probably increase the risk of further periodontal destruction. These findings may improve the clinical assessment of occlusal trauma and related periodontal conditions for better patient management and treatment outcomes. Objective: To determine if there was a difference in hard and soft tissue between northern Chinese and northern Indian adolescents with Angle Class II division 1 malocclusion. Method: A total of 40 Angle Class II division 1 patients, including 20 boys and 20 girls aged 10 to 13 years with no prior treatment, were selected from northern China and northern India, respectively. Overall, 80 cephalometric data were analysed based on two-sample t-test with SPSS software. Results: The Chinese subjects had larger anterior facial height and mandibular plane angle. Analysis of dentoalveolar complex showed that the Chinese subjects had more proclined incisors, protruding upper lips and more upper posterior tooth height than that of the Indian subjects. The length of the maxilla and mandible was larger in the Indian subjects than that of the Chinese subjects, but the length of mandible was not significantly different between the two groups. Conclusion: Compared with the Indian subjects, the Chinese subjects with Class II division 1 malocclusion had less prognathic maxillas, more protruding lips, steeper mandibular plane angles and more proclined maxillary incisors. Within the same gender, the Indian boys had more protruded faces and Indian girls had more protruded maxillas, steeper mandibular plane angles and fuller lips. Objective: To compare the clinical parameters and levels of salivary immunoglobulin A (IgA), Interleukin-1β (IL-1β) and matrix metalloproteinase-8 (MMP-8) in patients with moderate to severe chronic periodontitis and in individuals with healthy gingiva. 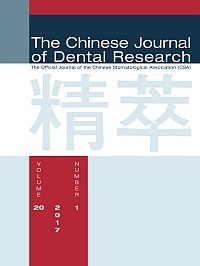 Methods: Levels of clinical parameters plaque index (PI), gingival index (GI), probing depth (PD), clinical attachment level (CAL) and bleeding on probing (BOP) along with salivary biomarkers salivary IgA, IL-1β and MMP-8 were recorded among 50 adults (30 test subjects with moderate to severe generalised chronic periodontitis, constituting group A, and 20 periodontally healthy controls - group B). Clinical evaluation was done before oral prophylaxis, and 6 weeks and 12 weeks after oral prophylaxis, and saliva samples were obtained before and 12 weeks after oral prophylaxis. Salivary IgA, IL-1β and MMP-8 levels in saliva were assessed using enzyme-linked immunosorbent assay. Results: In group A, there were highly significant differences in terms of PI, GI, PD, CAL and BOP before oral prophylaxis, and 6 weeks and 12 weeks after oral prophylaxis when compared at these intervals. Differences in their levels in group B were non-significant at such intervals except PI. Mean levels of salivary IgA, IL-1β and MMP-8 in chronic periodontitis patients at baseline were significantly higher than in the periodontally healthy group. Their levels in group A decreased significantly 12 weeks after oral prophylaxis, but remained static in group B. Conclusion: The levels of salivary IgA, IL-1β and MMP-8 showed significant reduction after oral prophylaxis, suggesting that these biomarkers could facilitate the screening, early diagnosis, and management of periodontal disease. A 10-year-old Chinese girl with two accessory maxillae and bilateral Tessier no. 7 clefts is presented. Radiographic examination showed two accessory maxillae, each containing 5 or 6 supernumerary permanent teeth. The two accessory maxillae extended from the inside of the zygomatic arch to the maxillary tuberosity symmetrically. Duplication of the maxilla is always associated with Amniotic Band Syndrome (ABS), but this case may be a distinct syndrome representing an under-recognised phenotype with bilateral maxillae duplication and Tessier no. 7 clefts.